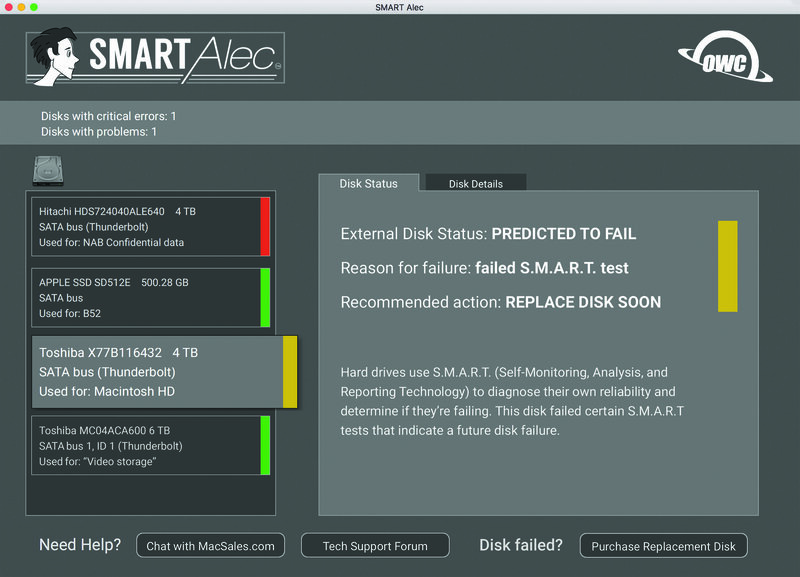 Modern hard drives have built-in diagnostic tools to warn of a drive failure before it happens, called S.M.A.R.T (which stands for Smart Monitoring Analysis and Reporting Technology), but few users know it’s there. By analyzing the performance of components in the drive, it’s possible to tell if a drive is likely to fail in much the same way that the systems in a car can predict if something is going to fail, and warn the users via a check-engine light. With drives, the system is in place to monitor the health of the hardware, but there’s no physical light that blinks when data is in jeopardy, except in high-end drive systems that monitor the SMART data. Several companies make software that can monitor drives for failure and alert users when they’re likely to occur, and OWC, the maker of drives, accessories and upgrades for Macs, is announcing their own tool, SMART Alec. Currently (free) in Beta, SMART Alec will be free on the Apple App Store, and a $9.99 version will provide additional features such as email alerts, USB/FireWire disk monitoring and more. A Windows version is in development currently. Mill Valley, CA, June 14, 2017 – OWC, a leading zero emissions Mac and PC technology company, announced today SMART Alec, an essential Mac utility that constantly monitors and checks your Mac hard drives, SSDs, Firewire disks, and USB drives, warning you in advance if drives are failing or about to fail, so you’ll have plenty of time to back up and replace a bad drive. SMART Alec can help you avoid losing years of sensitive, irreplaceable data from databases, word processing, Excel, PowerPoint and other business files, precious photos and videos, music compositions, and more. SMART Alec is currently available in beta at: smartalec.biz/beta_test. The free final version of SMART Alec and $9.99 upgrade with additional features will be available in July. “A check engine light for your disks,” Smart Alec’s Advanced Warning System employs Disk Data Analysis and Predictive Failure Analysis, quietly working in the background to alert you if your drives currently have, or are developing problems — before it’s too late and you experience catastrophic disk failure. SMART AlecTM is available in July as a free download from the iTunes App Store, with a $9.99 paid upgrade with additional features, including USB/Firewire disk monitoring, email alerts, and more. Drives Frequently Fail — Why Wait Until a Disk Drive Fails to Take Action? Although users expect hard drives to last forever, drives can frequently fail for numerous reasons, including overheating, power failures, surges from lightning strikes, water damage, and more. Once a drive fails, it can be virtually impossible or cost hundreds to thousands of dollars to reconstruct sensitive data through a computer technician or data recovery forensics company. Daily back-ups to a secondary drive are also risky, since unknowingly you may be backing up data from an already corrupted drive or to another drive with problems. Instead of waiting for the drive to fail or just hoping it won’t happen, users rely on SMART Alec’s continual background disk monitoring to protect sensitive data –Why wait until a disk drive fails to take action? PREDICTED-TO-FAIL DISK: If your disk is likely to fail in the near future, you’ll get a “predicted to fail” warning. FAILING DISK: If your disk is already failing, SMART Alec will tell you right away, giving you time to replace your disk and save your crucial data. TEST YOUR DISK: SMART Alec will display a green bar by all disks that are healthy. Still worried? Get SMART Alec to re-test disks at any time. KNOW YOUR DISK: All the information about your disk is readily available with a disk log to track your disk’s history. SMART Alec $9.99 Upgrade – Additional Features: • “SMART Over USB”: the free version is for SATA (Serial Advanced Technology Attachment) drives only, not USB/FireWire drives. The upgrade adds failure prediction for most USB or FireWire connected drives, including most USB 3 devices. • Email Notifications: in addition to desktop alerts, notifications are also emailed to you about failing or predicted-to-fail disks in case you are away from your disks. Blink Disk Light: a light blinks on the actual disk corresponding to the disk tile you have selected in the Smart Alec application. The free SMART Alec essential drive utility and $9.99 SMART Alec upgrade with USB/FireWire disk monitoring and other additional features will ship July 2017, with the free version available through the iTunes App store. A Windows version is in development. For more information, see https://www.smartalec.biz/ or Facebook: https://www.facebook.com/SMARTAlec.biz/. Free Beta Version Available Now SMART Alec is currently in its final beta testing stage. To sign up as a beta tester, go to smartalec.biz/beta_test. In future releases of SMART Alec, users will be able to opt-in to share data about disk reliability and performance with SMART Alec’s self-learning disk failure prediction system, an algorithm which will analyze disk data from users to more accurately predict likely disk failure. Once opted in, users will get access to the most up-to-date statistics about the safest—and least safe—disks available and the reliability of the disks they are using. The latest beta, SMART Alec 1.0 b26, offers support for OS X 10.9 (Mavericks). Based in Mill Valley, California, SoftRAID was founded in 1996 by a small team of Mac software engineers. SoftRAID provides high quality storage solutions for Mac OS, including SoftRAID and SMART Alec. The company’s founders have worked with disk drives on Mac OS since the Mac Plus shipped in 1986. In 2014, SoftRAID was acquired by OWC, the leading manufacturer and upgrade provider for Apple and PC enthusiasts, and renamed OWC Holdings, Inc. SoftRAID is included with all preconfigured OWC ThunderBay RAID enclosures and will power the upcoming OWC Mercury Viper SSD that offers read speeds of 4.6 GB/s and write speeds of 4.0 GB/s. SoftRAID is available from the online store at: SoftRAID.com/store or as a 30-day free trial from SoftRAID.com/freetrial. For more information, see http://www.SoftRAID.com, http://www.smartalec.biz, and http://www.macsales.com.